labradore: How did Paul Lane access this information? How did Paul Lane access this information? @drewfoundland @stephenkent have any of you been able to provide an actual definition or example of what constitutes 'frivolous or vexatious' yet, or...? @mark_watton @PaulLaneNL how would you know that? 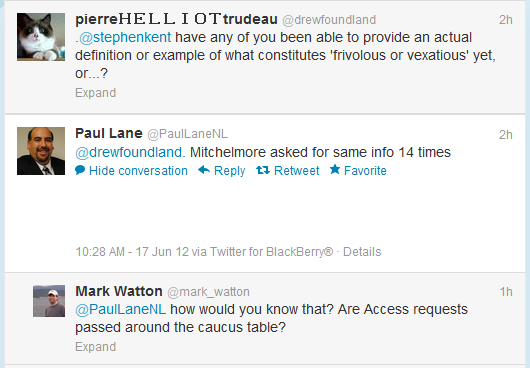 Are Access requests passed around the caucus table? He obtained it illegally, just as did all the other Tories who received briefings that (apparently) contained details of Access requests from specific individuals. I sher hope the OCIO will launch an immediate investgation.